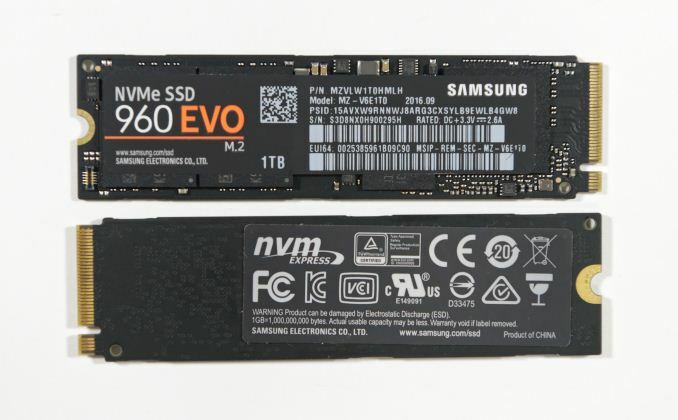 If the Samsung 960 Pro didn't exist and anybody other than Samsung released the 960 EVO, it would be a credible flagship product for today's SSD market. It is clearly faster than the Intel 750 everywhere that matters. It is on par with the OCZ RD400 on real-world workloads. It is generally slightly slower than last year's 950 Pro, but does improve on some of the 950's more acute weaknesses. It does all of this while being more power efficient under load, and the 960 EVO carries an MSRP that is lower than the current retail prices of other high-end PCIe SSDs. Of course, the 960 Pro does in fact exist and is being released alongside the 960 EVO. It looks like the two product lines will occupy similar positions within the PCIe SSD market that the 850 Pro and 850 EVO have within the SATA SSD market. The 960 Pro will hold the indisputable performance crown, but the 960 EVO will be the more popular product. The EVOs are not low-end drives by price or performance, and while they may not be the most affordable mid-range options, they're solid performers that benefit greatly from using the same high-end SSD controllers as their Pro counterparts. Unlike Intel's 600p budget TLC PCIe SSD, the 960 EVO always manages to be a big upgrade over any SATA SSD. The price and performance of the 960 EVO will make anything more expensive a very tough sell. The only advantage a drive like the the RD400 has is in its warranty period and endurance rating: the 960 EVO's three years and 0.3 DWPD are not exactly premium specifications, but neither are they low enough to cause much concern. The 960 Pro will offer a 2TB option and even higher performance, but those are expensive luxuries. The 960 EVO will be undercutting most of the PCIe SSD market with "good enough" performance. The Plextor M8Pe is currently in the SSD testbed where we don't expect it to surpass the OCZ RD400 or Samsung 960 EVO, but matching their performance would likely make the M8Pe the clear favorite over the 960 EVO. The one thing holding back the 960 EVO from becoming the default product recommendation among PCIe SSDs is the fact that some MLC-based drives will be competing with the 960 EVO on price and may also come close in performance.